04/12/19 - Kindergartners need Technology too! 03/25/19 - Fake News or Fact? How do you tell? 02/07/19 - Why is HUE HD a Must for your Classroom? 01/25/19 - How Is Cloud Computing Revolutionizing the Education Industry? 01/21/19 - It’s Here–the High School Technology Curriculum! 12/31/18 - Happy New Year! 11/25/18 - Big Sale at Teachers Pay Teachers! 11/16/18 - Happy Thanksgiving Week to All! 11/14/18 - A Thanksgiving Poll for Students–What does ‘Turkey’ mean? 10/22/18 - Is technology outpacing you? 10/04/18 - What Qualities Make an Effective Teacher? 09/12/18 - Print or Digital Textbooks? What’s the Low-down? 09/10/18 - High School Technology Curriculum Coming! 09/03/18 - Work Hard–it’s Labor Day! 08/24/18 - Wikispaces has closed. What are your alternatives? 08/17/18 - Curriculum Companions Start September 10th! 08/13/18 - Today’s Meet is Closed. What are your Alternatives? 07/04/18 - Happy Fourth of July! 07/02/18 - Should you Teach Typing? And Does it Work? 06/18/18 - Gamechanger: Type to Learn is Now in the Cloud! 06/13/18 - How can Teachers Increase Social Learning While Teaching Online? 06/11/18 - SL Curricula Online Resources are Moving! 05/29/18 - Touch-Typing: Rote vs Integrated Learning or Rote and Integrated Learning? 03/02/18 - International Blog Delurking Week–Get Involved! 02/21/18 - What is the VARK model of Student Learning? 02/05/18 - Tech Tips #170: Cover your webcam! 01/24/18 - What is a Growth Mindset? 12/31/17 - Happy New Year! 12/11/17 - Feeling Thankful? Any Spare Holiday Spirit? 11/19/17 - Happy Thanksgiving Week to All! 11/02/17 - Hour of Code is Coming! 10/20/17 - What is Standards-based Grading? 10/12/17 - Should You Unschool? 09/29/17 - Highly-versatile, Easy-to-use Form Creator–and it’s free! 09/06/17 - Curriculum Companions Start September 10th! 09/04/17 - Have a Happy, Productive Labor Day! 08/25/17 - It’s Time to go Back to School. Lots of Ideas! 08/11/17 - Is Whole Brain Teaching Right for Me? 07/28/17 - What is Microsoft Sway? 07/19/17 - Is Orton-Gillingham Right For Your Students? 07/04/17 - Happy Fourth of July! 06/21/17 - Is the Socratic Method Right for Your Class? 06/05/17 - Differentiate with Tech–Starts June 12th! 06/01/17 - Looking for a Summer Volunteer Opportunity? 05/15/17 - Can an AI Save the World? 04/24/17 - 169 Tech Tip #82: How do I use a ‘Read Only’ Doc? 04/13/17 - Understanding By Design — What’s That Even Mean? 04/11/17 - Visit My New Houghton Mifflin Harcourt Store! 03/03/17 - 169 Tech Tip #119–What to do when Computers are Down? 02/17/17 - What’s a Digipuzzle? 01/27/17 - Why is PBL So Popular in Schools? 01/26/17 - What is Google Keep and Why Use it in Your Classroom? 01/11/17 - Did You Miss These Posts Over the Holidays? 12/07/16 - Where did Christmas Come From? 11/18/16 - Happy Thanksgiving Week to All! 11/15/16 - Hour of Code–What is it? 11/14/16 - Hour of Code–Is it the right choice? 11/12/16 - World Typeathon Starts Monday–Join in! 11/04/16 - The Power of Symbols–What does the word ‘Turkey’ mean? 09/05/16 - Productive Labor Day! 08/24/16 - Tech-Savvy Seniors: Myth or Present-Day Reality? 07/31/16 - How Do Non-Techie Parents Handle the Increasing Focus of Technology in Education? 07/15/16 - Differentiate with Tech–Starts July 18th! 07/04/16 - Happy July 4th! 06/27/16 - Dear Otto: How do I create a classroom library checkout system? 06/22/16 - Dear Otto: My Students Think Hunt-and-Peck is Good Enough. What do I do? 05/30/16 - Happy Memorial Day! 03/24/16 - Dear Otto: How do I teach vocabulary? 02/23/16 - Summer PD–What are you looking for? 02/18/16 - Dear Otto: Can We Eliminate Blogs–Teachers Hate Them! 02/09/16 - Dear Otto: How do I Make Keyboarding Collaborative? 02/08/16 - Digital Literacy–What is it? 01/28/16 - What’s Groundhog Day?? 01/26/16 - What are Good Tech Goals for Students? 01/22/16 - Dear Otto: I need to convert from PDF to Doc–Does that work? 01/12/16 - Did You Miss These Posts Over the Holidays? 12/16/15 - Where’d Christmas Come From? 12/07/15 - Get Ready for the New Year! 11/21/15 - Happy Thanksgiving Week to All! 11/20/15 - Hour of Code: Scratch Jr.
11/16/15 - The Power of Symbols–What does the word ‘Turkey’ mean? 11/04/15 - Tech Tip #120: Why Use Airplane Mode? 10/28/15 - Tech Tip #119: What do I do when computers are down? 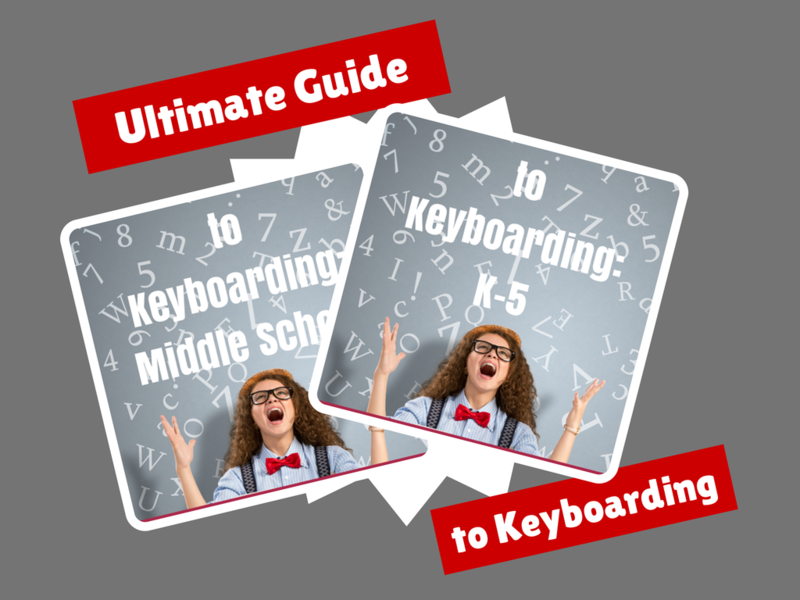 10/26/15 - Dear Otto: How do I Teach Keyboarding in My Limited Class Time? Three projects over six weeks and your students will learn about blueprints, room layout, dimensions. Plus, they'll understand how to think about a three-dimensional object and then spatially lay it out on paper. This is challenging, but fun for first graders. 09/07/15 - Happy Labor Day! 08/31/15 - Tech Tip #113: Back up Your Blog! 08/10/15 - Tech Tip #110: Can’t Get Sound to Work? 07/28/15 - Tech Tip #108: Got a Tech Problem? Google It! 07/15/15 - What’s a Tech Teacher Do With Their Summer Off? 07/04/15 - Happy July 4th! 06/19/15 - Faceoff: What Digital Device Should My School Buy? 05/21/15 - #101: Don’t Print Homework–Email it! 05/13/15 - Dear Otto: What’s a good End-of-year Tech Show? 05/10/15 - Happy Mother’s Day! Q: My internet stopped working on my laptop. Everyone else's in the house works, but mine won't connect. What do I do? A: First: Make sure the laptop button that allows connection to the internet is on. More often than not, that's the problem for teachers at my school. If it's not that, it gets much more complicated. I'll cross my fingers. 04/07/15 - Google Hangouts–Are You Using Them Yet? 03/30/15 - Chromebooks in the Classrooms–Friend or Foe? 03/24/15 - What is the 21st Century Lesson Plan? 03/08/15 - What’s With Daylight Savings? 02/24/15 - Summer PD–What are you looking for? 02/12/15 - Happy President’s Day! 02/01/15 - What’s Groundhog Day?? 01/27/15 - Lesson Plans: Where Did I Come From? 01/14/15 - Did You Miss These Posts Over the Holidays? 12/15/14 - End of Year Tips: Is Your Online Presence Up to Date? 12/11/14 - Get Ready for the New Year! 12/05/14 - Student Workbooks Now Available! 11/12/14 - The Power of Symbols–What does ‘Turkey’ mean? 10/01/14 - Shout Out to Tech Curriculum Folks–Freebie! 09/04/14 - Do Your Children Need Computers for School? 09/01/14 - Happy Labor Day! 08/18/14 - Dear Otto: What’s a good Technology Acceptable Use Policy? 08/14/14 - Curriculum Companions Start August 18th–Are You Ready? 08/07/14 - What’s the Classroom of the Future Look Like? 07/04/14 - Happy July 4th! 07/02/14 - Summer PD–Join us! 06/25/14 - How do I teach a program I don’t know how to use? 06/09/14 - Dear Otto: Should I fix ‘Thumb clicking’? I teach K-5 technology. A constant problem is finding websites that communicate in language elementary school students can understand. I've tried the kid browser, but they are sometimes too limited in their content. Google's advanced search, rolled out in December 2010, is a better solution. 05/09/14 - Happy Mother’s Day! 04/28/14 - Tech Tip #83: How Do I Use a ‘Read Only’ Doc? 04/22/14 - Dear Otto: How do I prepare students for PARCC Tests? 04/15/14 - Why Digital Textbooks? 03/17/14 - Dear Otto: How do I use avatars? 03/10/14 - Dear Otto: How do you teach file types? 03/05/14 - Dear Otto: Are there any Good Keyboarding Apps? 02/27/14 - Big Sale at Teachers Pay Teachers! 02/26/14 - What do you do when Little Johnny wants career, not college? 02/18/14 - Dear Otto: What Online Parental Controls Work? 02/17/14 - Happy President’s Day! 02/11/14 - Tech Tip #73: Alt+??? Brings up which Menu Command? 02/10/14 - It’s Here–(updated) 6th Grade Technology Curriculum! 01/28/14 - Dear Otto: How do I grade technology in my school? 12/18/13 - Once a Year Blog Maintenance–Are You Up to Date? 12/11/13 - Dear Otto: What do I do with students who ‘get’ tech really fast? 12/10/13 - Tech Tip: Back up Your Blog for the Holiday! 12/07/13 - App Building–for Teachers! 11/16/13 - How is Technology Useful in Skill Building? 11/13/13 - Dear Otto: How do I assess a project like Movie Maker? 11/05/13 - Dear Otto: Is it important that students use all fingers when typing? 11/03/13 - What’s a Tech Teacher Do All Day? 10/23/13 - Dear Otto: What about blogging? 10/16/13 - Dear Otto: How do I teach Google Drive to K/1? 09/18/13 - Dear Otto: What’s a good kids website creator? 09/02/13 - Happy Labor Day! 08/19/13 - Tech Tip #63: Don’t Like Double Space Between Paragraphs? 08/13/13 - Dear Otto: Use Tech to Differentiate Lessons? 08/06/13 - Dear Otto: How do I teach [wild and crazy] 7th Grade Tech? 08/03/13 - It’s Here–8th Grade Technology Curriculum! 07/24/13 - Dear Otto: Common Core requires publishing student work. How do I do that? 07/17/13 - Dear Otto: What are Common Core keyboarding standards? 07/08/13 - Dear Otto: How do I teach keyboarding in a 25-minute class? 07/04/13 - Happy July 4th! 06/24/13 - Do you like Online Training? 06/17/13 - What’s a Tech Teacher Do With Their Summer Off? 06/16/13 - Happy Father’s Day! 06/13/13 - It’s Here–7th Grade Technology Curriculum! 06/10/13 - Summer Tech Tips–What Do You Need? 05/28/13 - Tech Tip #113: Back up Your Blog! 05/22/13 - Dear Otto: Do Students Still Need to Learn Keyboarding? 05/15/13 - It’s Here! K-5 Tech Curriculum Aligned with Common Core! 05/06/13 - Dear Otto: How do I prevent printer pandemonium? 05/01/13 - CSTA Conference Coming Up! 04/29/13 - Which is better for schools: iPads or laptops? 04/15/13 - Dear Otto: What’s a good Website program? 04/09/13 - Tech Tip #45: Your Screen Upside Down? 04/01/13 - Dear Otto: Any Ideas for Tech Ed Benchmark Assessments? 03/25/13 - Dear Otto: How Do I Teach Citations? 03/18/13 - Dear Otto: How Can Students Keep Track of Passwords? 03/11/13 - Dear Otto: How do I prevent printer pandemonium? 03/04/13 - Dear Otto: What Can I Use Besides PowerPoint? 02/26/13 - Tech Tip #110: Sound Doesn’t Work? 02/14/13 - What are You Doing for Valentine’s Day? 02/12/13 - Tech Tip #40: Where Did Windows Explorer Go? 02/06/13 - Dear Otto: When will the 7/8 Technology Curriculum Textbooks be out? 01/25/13 - Great Websites Updated! 12/13/12 - Dear Otto: Should I stick with age limits on websites? 11/29/12 - Dear Otto: PowerPoint or Publisher? 10/22/12 - Dear Otto: What Keyboard Curriculum is Best? 10/15/12 - Dear Otto: I need more guidance than the curriculum offers. What do I do? 10/09/12 - Tech Tip #107: Got a Tech Problem? Google It! 10/08/12 - Dear Otto: Is Keyboarding Not for Cool Students? 10/03/12 - Is Keyboarding Dead? 10/01/12 - Dear Otto: How Do I Prepare for an Unknown Tech Future? 09/26/12 - What’s a Digital Portfolio and Why Should You Use it? 09/24/12 - Dear Otto: What Are Good Guidelines for Younger Bloggers? 09/20/12 - Will Texting Destroy Writing Skills? 09/10/12 - When is Typing Faster Than Handwriting? 08/27/12 - Dear Otto: What’s a good student email program? 08/23/12 - Do Your Children Need Computers for School? 08/20/12 - Dear Otto: What’s a good program to create an online ezine? 08/09/12 - Dear Otto: My computers are old. What do I do? 07/30/12 - Dear Otto: What About Carmen San Diego? 07/25/12 - Why do Educators Use Pinterest? 07/16/12 - Dear Otto: What Online Images are Free? 07/04/12 - Happy July 4th! 06/24/12 - Dear Otto: Should Students Space Once or Twice After a Period? 06/23/12 - What’s a Tech Teacher Do With Their Summer Off? 06/18/12 - Dear Otto: What Can I Use Besides TuxPaint/KidPix? 06/11/12 - Dear Otto: How Do You Teach Adults to Keyboard? 05/31/12 - Dear Otto: Where Can I Find Kid-safe Images? 05/22/12 - Tech Tip #17: What’s Today’s Date? Q: Every time I click on a drop down menu in MS Office (Word, Publisher, Excel, PowerPoint), it shows only some of the choices. How can I see all of them? 04/24/12 - Tech Tip #14: Did Your Desktop Icons Disappear? Q: I need a faster way to access menus. Is there one? 04/16/12 - Dear Otto: What About Teacher Tech Training? 04/12/12 - How Do I Decide What to Write About? 04/02/12 - Dear Otto: How Do You Keep Students From Playing with Settings? Students select from a list of Wonders of the World (or locations put together in conjunction with the classroom teacher). They do brief research on it, locate it using Google Earth and make a short presentation to the class about it. How do I quickly hide what I'm working on from prying eyes. Not just the Win 7 key that minimizes everything to the desktop, but so it looks like I'm working on something else than what I am? 03/19/12 - Dear Otto: How do I protect my lab? It's clean, easy-to-maneuver, with just a bit of unobtrusive advertising to pay the bills, and she offers dozens--hundreds?--of age-appropriate free downloadable audio books. 03/14/12 - Should You Dump Twitter? I only want to print part of the webpage, not the entire thing. Other than copy-pasting a selection into a Word doc or using PrintKey or Jing (they're not on some of the computers I use at work or friends' houses), how do I quickly print just a selection? When I insert my picture, the background isn't transparent, so it covers everything behind it. I want it see-through. How do I do that? BTW, I'm using Publisher. One of the favorites of my students is Ships. It gives them an opportunity to stand at the helm of the ship of their choice and guide it through the world's oceans. 02/16/12 - Do Teacher Ed Programs Prepare Students for Technology Needs of the Classroom? Q: Some programs hide the taskbar when they open (especially for young children--like KidPix). How do I access other programs without closing down the one I'm working on? There are lots of great online vocabulary websites to help kids learn high-frequency and dolch words. I’ll share five of them. Maybe you have some to share with the group. 02/10/12 - Great Websites Updated! 02/02/12 - Dear Otto: What iPad Apps Do You Recommend? Q: Every time I type, it covers up everything that comes after. 01/16/12 - 6th Grade Technology Textbook is Here! Q: I can't find enough detail about a particular area of the world that we're studying in class. Any suggestions? 12/13/11 - Tech Tip #63: Don’t Like Double Space Between Paragraphs? Q: My Word 2010 came with a double space between paragraphs as the default, but I don't like that. I've tried to reset it to single space, but it doesn't fix it. What do I do? A: I don't either. What was Bill Gates thinking? Create a holiday card using Publisher’s templates. Make it simple (don’t edit text, add only one picture) for youngers. Let olders change as much as they wish. Use this lesson to teach youngers about templates and olders about design, and menus. This project is very easy so shows students how fun and simple computers are. was helping one of the faculty at my school. She couldn't print a document (server problems) so I suggested she email it to herself at home and print it there. She started going online to her Yahoo account and I stopped her. Click the email tool on the Word toolbar. Blackle was created by Heap Media to remind us all to take small steps in our everyday lives to save energy. Kids always get confused when I'm explaining directions that require the right mouse button. I've found an easy way to clarify. Here's an example: "Right click with your mouse"
11/23/11 - #41: Where is That? Q: How do I create a shortcut on my desktop so I can find my programs easier? An interactive trip through the solar system that can be embedded into a web page (must take Flash, so not WP.com, but it worked fine on my WP.org side) or a start page (click to see my sample). what a great way to get kids excited about space. 11/16/11 - Nominations For Edublog Awards Now Open! Q: How do you create the copyright symbol in Word? Q: I work with younger students (first grade, second grade, even third grade). We're using Office 2003. When I direct them to the menu bar and one of the dropdown menu choices, sometimes it isn't there. Instead, there's a chevron--double arrow--that they have to click to expand the menu. This is confusing for youngers. Is there any way to have the entire menu drop down rather than the truncated version? Q: What's the easiest way to introduce 3rd graders to Excel charts? Q: I'm teaching my students to create a book report with a cover page. what's the easiest way to get the cover on the first page and the report on the second? Q: I can't find the shortcut for a program I want to open. It's not on the desktop, on the start menu or in 'all programs'. How do I open the program? A: Try 'Start button', then type in the name of the program where it says 'start search'. The shortcut shows up. start each week off with a fully-adaptable K-8 lesson that includes step-by-step directions as well as relevant ISTE national standards, tie-ins, extensions, troubleshooting and more. Eventually, you'll get the entire Technology Toolkit book. If you can't wait, you can purchase the curriculum here. These are my 62 favorite first grade websites. I sprinkle them in throughout the year, adding several each week to the class internet start page, deleting others. I make sure I have 3-4 each week that integrate with classroom lesson plans, 3-4 that deal with technology skills and a few that simply excite students about tech in education. Q: There's a program I use all the time, but it's not on my desktop. I have to click through All-Programs-(etc--wherever it is you must go to find it). Is there a way to add it to my start menu so I can find it more easily? A: Absolutely. Click through All-programs to wherever it is, but don't open the program. Instead, right click on the icon that would normally open the program and select 'pin to start menu' from the drop down menu. This will attack this program to your Start button in the future. Much easier! Q: Something happened and now my computer isn't working right. I downloaded a program/music/video or installed a new holiday program and it hasn't worked right since. What do I do? A: These days, that's not as hard as it used to be. All you have to do is type 'restore' in the search box (on the start menu) and follow instructions. What it'll do is turn your computer back to an earlier date, before you did the download or the install. It won't affect documents, only the bad stuff. It's saved me several times. Plus, Noodle offers a 'school selection' tool, to enable parents and high schoolers to search for the right school, from kindergarten through college. Once you've set up an account, Noodle allows you to keep track of the schools you’ve applied to or been admitted to, or classify schools based on criteria such as cost, campus setting, etc. You can keep these lists private or make them public so that your friends can see them. You can organize a classroom with blogs, internet start pages (click for more on internet start pages), wikis, even twitter (Click for more on twitter). Wikis are the most thorough. Take a look at my first grade class wiki . I have room for student and parent resources, homework, What we did Today (for absent students or parents), grade-level skills, favorite links. You can even add student pages, created by students. You can organize a classroom with blogs, internet start pages (click for more on internet start pages), wikis, even twitter (Click for more on twitter). Wikis are the most thorough. Take a look at mykindergarten grade class wiki . I have room for student and parent resources, homework, What we did Today (for absent students or parents), grade-level skills, favorite links. One final note, the ISTE tech conference I attended back in June of over 15,000 educators chronically listed Khan Academy as among the most-important websites for video tutorials on the web. Attendees and presenters constantly raved about Khan Academy as a self-help site far beyond any other available, on a par with MIT's offering of free videos of their course offerings. Check it out. You won't be disappointed. Q: I'm copy-pasting between a Word doc and an Excel doc on my computer. I know how to do that, but here's the problem: I have three Word docs open. I don't want to close the other two because I'll need them soon. It takes a lot of time to click down to the taskbar, bring up the Word group and find the correct Word doc. Is there an easier way? A: Oh yes, Much easier. Use Alt+tab. That takes you to the last window you visited. If you're toggling between two windows, this is the perfect solution. I use it a lot for grading and report cards. 09/01/11 - School’s Back–Do Your Children Need Computers? 08/31/11 - Free Ebook Anyone? Can I Ask a Favor? 08/30/11 - Tech Tip #45: Your Screen Upside Down? Q: My screen is sideways 90 degrees. How do I fix that? A: If you ever needed this, you're going to be blessing me. If you've never faced that off-kilter screen, you're going to wonder why I'd post this tip. 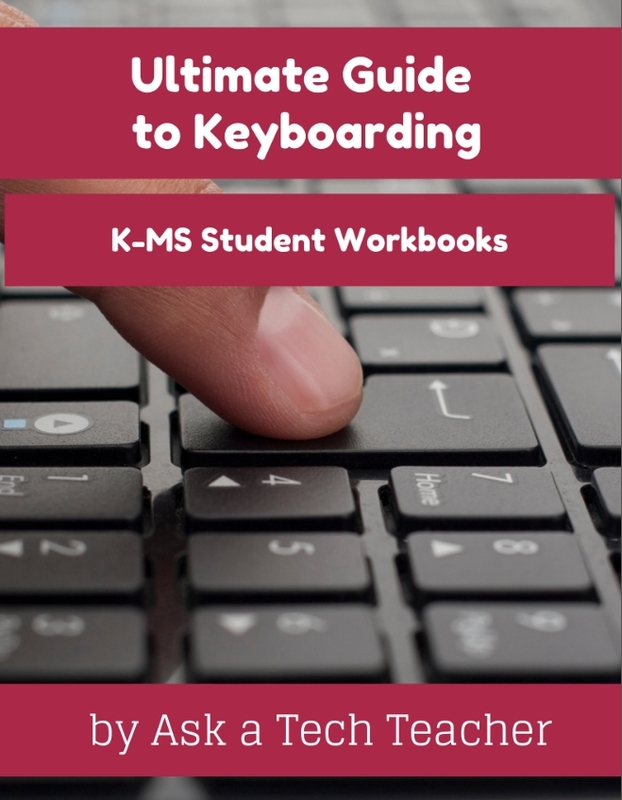 If you've been thrown into the slot of tech teacher at your school, or just want to shake up the program you've been teaching for years, this wiki will take you through how to teach keyboarding to grades 2-8. It's a real-time wiki, meaning I'm using it right now, so you'll see lots of changes every day. Currently, I'm teaching a summer keyboard class to 4th graders, so that's what's under What We Did Today. When the school year returns, it'll be more of a monthly approach to guide students through skills they need to learn in thirty days. Q: I'm supposed to find a tool on the toolbar, but there are so many and I have no idea what they are for? It's just as bunch of pictures to me. Is there an easy way to figure this out? A: To figure out what a tool does on the toolbar or 2007/10''s ribbon, hover your mouse over the tool (place the mouse above it without clicking). A tool tip will appear with a clue as to what it's for. Bloom's Taxonomy has long been accepted as the de rigueur classification of learning objectives. Its consideration as a foundational and essential element within the education community is memorialized in the 1994 yearbook of the National Society for the Study of Education. Lesson plans are written with a focus on which of these objectives are met and how to achieve all of them within a school year. Volume I is 219 pages and Volume II 235 pages, making this series an all-in-one K-8 toolkit for the lab specialist, classroom teacher and homeschooler, with a years-worth of simple-to-follow projects for K-8. Integrate technology into language arts, geography, history, problem solving, research skills, and science lesson plans and units of inquiry using teacher resources that meet NETS-S national guidelines and many state standards. The fifty-five projects are categorized by subject, program (software), and skill (grade) level. 07/28/11 - Are you as Tech-Smart as a Fifth Grader? I'm glad you asked that question because, they absolutely do stand out. They start kids in kindergarten with age-appropriate and challenging skills in programs such as keyboarding and KidPix, and that wonderful online reading site, Starfall.com. I am one of the editors for this series, though it's a collaboration of a team of technology teachers. We've included links to free versions of software so users aren't forced to purchase expensive software. We've included many how-to's on timely technology topics like when to start keyboarding, how to integrate Web 2.0 tools into classrooms and more. We've also connected the Fourth Edition to this Ask a Tech Teacher blog so users can stay up-to-date on tech in their classes and can get immediate assistance with lessons should they get stuck. And, we've put the entire workbook in a three ring binder making it easy to remove reproducibles for copying without ruining the book. Q: How often should I back up my current project? How about my whole hard drive? A: I teach my students to save early, save often when they're working on a project. You decide what you can tolerate losing. Ten minutes or Ten hours. After all, if the computer loses your work, you're the one who has to start over. Q: I don't know what I did, but my computer doesn't run right anymore. What can I do? A: With access to the internet, computer malfunctions have become even more prevalent than ever. Sometimes you download a program--or your child mistakenly pushes a button that allows malware on your computer. Suddenly, through no fault of your own, things just aren't working right anymore. Visuwords is an online graphical dictionary where you can look up words to find their meanings and associations with other words and concepts. The tool enables you to produce diagrams and learn how words associate and is another of the great Open Source websites (yes, they give their source code as well as the web site away for free)--like Visual Thesaurus, Wordle, Tagxedo--that makes the study of words as visual as a picture. 06/14/11 - Tech Tip #40: Where Did Windows Explorer Go? Q: I have Windows 7 and I can't find Explorer anymore. Where did it go? A: Right click on the start button and select 'Explore'. Disclaimer: I am one of the editors for this series, though it's a collaboration of a team of technology teachers. We've included links to free versions of software so users aren't forced to purchase expensive software. We've included many how-to's on timely technology topics like when to start keyboarding, how to integrate Web 2.0 tools into classrooms and more. We've also connected the Fourth Edition to this Ask a Tech Teacher blog so users can stay up-to-date on tech in their classes and can get immediate assistance with lessons should they get stuck. And, we've put the entire workbook in a three ring binder making it easy to remove reproducibles for copying without ruining the book. In my classroom, we use KidPix. It's a wonderful program to introduce students to tools, toolbars, text, drag-and-drop mouse skills and all the basics required to use the computer. It's the gold standard for acclimatizing children to computers. Students always love it and parents always want to know how to get it for them. Q: My desktop icons (those little pictures that allow you to open a program) are all different. What happened? A: I get this question a lot. Push the start button and check who the log in is. That's the name at the top of the right-hand side of the start menu. It should have your log-in name. Any other, log out and log in as yourself and the world will tilt back to normal. Q: My tools for formatting disappeared from the top of my MS Word (2003). Where'd they go and what do I do? A: They do disappear at times, for no good reason. Here's the simple fix: * Right-click in the toolbar area at the top. 05/07/11 - #101: Don’t Print Homework–Email it! Q: My internet toolbar disappeared. All I see at the top of the screen is, more of the page I'm on. No tools. What do I do? A: Push F11. You can hide the internet toolbar or unhide with F11. It's that simple. The all-in-one K-8 toolkit for the lab specialist, classroom teacher and homeschooler, with a years-worth of simple-to-follow projects. Integrate technology into language arts, geography, history, problem solving, research skills, and science lesson plans and units of inquiry using teacher resources that meet NETS-S national guidelines and many state standards. Explore museums from around the world with Google's incredible Street View technology. Discover and view hundreds of artworks at incredible zoom levels, and even create and share your own collection of masterpieces. Mission US is a FREE multimedia project featuring free interactive adventure games set in different eras of U.S. history. Q: The taskbar at the bottom of my screen got moved. I liked it at the bottom. How do I move it back? This starts as a dictionary, but it's so much more. MIT has stepped to the front of education equity issues. For the past year, they've made their scholarly articles FREE to the public through an open source platform called DSpace, a scholarly repository for over one-thousand organizations (if you have a favorite University, i.e., Notre Dame or USC, check to see if it's listed here). The challenge as the tech coordinator at my school is to persuade teachers to integrate technology into their classrooms. Kids are easy. I know that first-hand because I teach K-8 technology classes also. Q: I pushed the menu command I wanted to use (in MS Office 2003). I got the drop-down list, but the command I needed was greyed out. When I pushed it, nothing happened. What do I do? 03/29/11 - Tech Tip: I Deleted a File! This program has a clean, simple interface with none of the vibrant colors, constant motion and advertising of so many other math websites. What a great way to upsize student projects. Simply upload a digital picture created by students. Tell the program what size you'd like the poster and the program automatically figures out how to lay it out on 8x10 sheets and its ready to print. While YouTube has some of the best training videos around, if your school's like mine, you can't access it on campus. Which means, I'm constantly on the look-out for a good alternative in this video-oriented education world I find myself. I found Sqooltube. When you arrive at Breathing Earth, it’s not obvious what to do. You see a map of the world, browns and oranges with a few darker shades. Occasionally, a nation lights up, painted red. Bursts of blue and black explode here and there, seemingly randomly. Look closer. There’s order to the chaos. There are lots of story makers out there, but this one is a cut above. It was developed by graduate students at Carnegie Mellon University to increase literacy rates among young children while appealing to their techno-gene in this fast-moving society. If you're a Google Earth/Google Maps fan--as I am--you probably haven't kept up with what Bing Maps is doing over there, in the competitor's home. I came across this video on TED and was blown away. Blaise Agüera y Arcas is the architect of Bing Maps at Microsoft, building augmented reality into searchable maps. TED, as its tagline says, is truly 'riveting talks by remarkable people, free to the world'. T-E-D stands for Technology, entertainment, design, and gives you a good idea how they approach this avenue for sharing knowledge. You sit down to type, start in on that long project with an imminent deadline, and nothing happens. The cursor blinks... and blinks... and blinks... but goes nowhere. 02/28/11 - Where Would You Like to Go Today? If you haven't discovered Tagxedo, you have a treat in store. As its tagline suggests, it is a tag cloud with style. Think Wordle on steroids. Tagxedo takes words and turns them into pictures, as does Wordle, but it has all those options you wanted and couldn't find on Wordle. Remember saying, "I wish I could turn this into a picture of a ____ (fill in the blank with your favorite)." Or, "I wish I could save this." MS Web Apps is one of the stable of FREE online tools to replace or enhance installed software. Though MS Office has a gazillion percent of the marketplace, as we the people become more mobile, more interactive, MS Office has become tattered at the edges. It doesn't run with all versions of itself. It is linked to a specific computer--incompatible between Macs and PC (fixable), between Office and other word processing programs (fixable at times), documents aren't available online (you have to convert to a pdf to display the doc or upload as an icon). A document can't be shared. You can organize a classroom with blogs, internet start pages (click for more on internet start pages), wikis, even twitter (this is the only one I have yet to use because my Admin shut me down on it. Click for more on twitter). Use Webspiration anywhere you'd use the software, Inspiration. It will map out ideas, organize with outlines and collaborate online with teams or colleagues. Webspiration allows you to appeal to students who are visual learners as it strengthens organizational skills, and transforms your ideas and information into knowledge. I use this as practice in my tech classes. Students love seeing their typing speed improve, and it shows them the importance of subtracting for errors (we all know how time-consuming correcting typos is). I often see them go to this site during free time, especially when the next speed quiz is imminent. I think your kids will enjoy it, too. 02/03/11 - Can Your Fifth Grader Answer This Math Problem? Teaching Math In 1950: A logger sold a truckload of lumber for $100. His cost of production is 4/5 of the price. What is his profit? Teaching Math In 1960: A logger sold a truckload of lumber for $100. His cost of production is 4/5 of the price, or $80. What is his profit? * 1 in 10 Americans are endangered by the poor handwriting of physicians. * citizens miss out on $95,000,000 in tax refunds because the taxman can't read their handwriting * Poor handwriting costs businesses $200,000,000 in time and money that result in confused and inefficient employees, phone calls made to wrong numbers, and letters delivered to incorrect addresses. Q:I see a blue phrase on my page. It's underlined. I'm told that's a link to a website. How do I make it work? A: Activating a link in MS Word or most of the MS Office products is pretty simple. There's so much to like about this website. Target users are young children, so I like that this website requires little reading. Once they get to the site (I have a link on our classroom start page for NORAD Santa), they can watch a Santa video while I get everyone else logged on. 12/15/10 - What is Authority and How Did I Get It? Q: I don't know why, but I never remember the date. Unfortunately, I have to type it often at school/work/home. Is there a shortcut for people like me? 12/13/10 - Can Technology Help Teachers Plan? One of the engines helps teachers do what I had presented about years ago and it helps them make those four choices of activities in less than 10 minutes! I include everything that my students might need to start their tech class experience--a Todo list, links to projects, sponges, a calendar--and I change it weekly, sometimes daily. A: Saving is easier than you think. I know, you're thinking it is easy, so what's the deal? Do you save every ten minutes? Hover over the 2003 tool that you are trying to find in 2007. It will show a tool tip that tells you where it is in 2007. This one is pretty freaky. The faces are realistic. They smile at you, react to your mouse movement, wink, stick their tongues out. You have to see it to believe it. What it doesn't have that the software version has is the ability to fly a plane (using Google Earth's built-in Flight Simulator) all over Mars. My students love doing this. I didn't teach it to them at all. They were curious, motivated and figured it out on their own. I love student-led activities. Create a diagram to represent the layers of where we are in the universe. Great for visual thinkers. 10/19/10 - Tech Tip #14: Desktop Icons Disappear? Q: My desktop icons disappeared for no known reason. What do I do? A: This is a question I get from parents more often than you'd think. Use an Enchanted Learning template. Import it into KidPix. Students use the paint bucket to fill continents and oceans different colors. Then label them as detailed as is age appropriate. 10/16/10 - What’s it Like to Be a Blogger? Dog's eyes follow your mouse and he speaks what you write--what could be better! Q: I need a faster way to access menus. Is there one? A: Yes, and you'll love it. show them where each part connects to the computer. Have them plug in andMouse-02 disconnect the headphones, the microphone (if available). Q: I want my text to wrap around the picture I inserted, but it goes under/above it. There's a big white space I can't type in. What do I do? A: I get this from students a lot. Create a cross. Label the four directions. Place a picture that coordinates with that direction by it. Every time I click on a drop down menu in MS Office (Word, Publisher, Excel, PowerPoint), it shows only some of the choices. How can I see all of them? Press "alt+tab" simultaneously on your keyboard (or Command-Tab on a Mac). It'll hide the window that's on your screen and bring up one from behind it. This trick is used most often by office personnel, hiding the fact that they're surfing the Net at work, but it's useful for any number of other reasons. It's also a verb, as in, "I had to alt+tab when my boyfriend dropped by." I have room for student and parent resources, homework, What we did Today (for absent students or parents), grade-level skills, favorite links. You can even add student pages, created by students. This is very popular. Have students type three or four of their site-dolch words into KidPix. Create a quasi-sentence, filling in the missing nouns, verbs, etc with stamps from KidPix toolbars. Online resources for great worldwide museums. Take one lesson to introduce students to these six art sites (five to ten minutes on each) and then allow them to revisit when they have a few minutes at the end of a class projects, unit, before lunch, etc. As hard as parents try, it's difficult to dig through backpacks and uncover test scores, grading rubrics, and their ilk. It's likely grades will be available online. Take advantage of the ability to check your child's grades. Know there's a problem when there's still time to fix it. he online version includes built-in tours of the moon which are fascinating, but doesn't have the flight simulator that my students can't get enough of. They fly all around our galaxy, to other planets, other stars. They think it’s pretty amazing to land on the Sun! If your child must have MS Office and you are trying to fit the price into a budget, start with Office Web Apps, the free online version of Office. It's compatible with MS Office, much like it but more limited. A good starter. You can organize a classroom with blogs, internet start pages (click for more on internet start pages), wikis, even twitter (this is the only one I have yet to use because my Admin shut me down on it. Take a look at my kindergarten grade class wiki . I have room for student and parent resources, homework, What we did Today (for absent students or parents), grade-level skills, favorite links. You can even add student pages, created by students. This is very popular in the older grades. Highlight the desired text, Press Ctrl+P, In the Print dialog box that appears, in Print Range area, click Selection, then click OK.
Used properly, email encourages collaboration among teachers, encourages conversations between parents-students-faculty and facilitates the paperless submittal of homework and projects (no more dog-ate-my-homework excuses). I found it easy to use, straightforward, nonthreatening. I like the entire series. a year's-worth of age-appropriate computer training in MS Word, PowerPoint, Publisher, Excel, Google Earth, keyboarding, vocabulary, and computer problem solving. Everything meets and exceeds ISTE, NCLB standards. Also included is an Appendix of over 200 age-appropriate child-friendly websites. Skills taught include collaboration, communication, critical thinking, problem solving, decision making, creativity, digital citizenship, information fluency, presentation, and technology concepts. I include everything that my students might need to start their tech class experience–a Todo list, links to projects, sponges, a calendar–and I change it weekly, sometimes daily. It has tabs, too, so I offer a different tab for each class. This is a well-thought out approach that seems to insure (at least, according to the students I interviewed) the least amount of frustration and the greatest amount of learning. As a result, the students I talked to always felt prepared for what they learned next. The parents I talked with were across the board amazed at what students accomplished. No one felt their students were bored or that tech class was 'babysitting'--wasted time--as happens in some situations. 08/03/10 - Which Social Media Should Be Allowed in Schools? 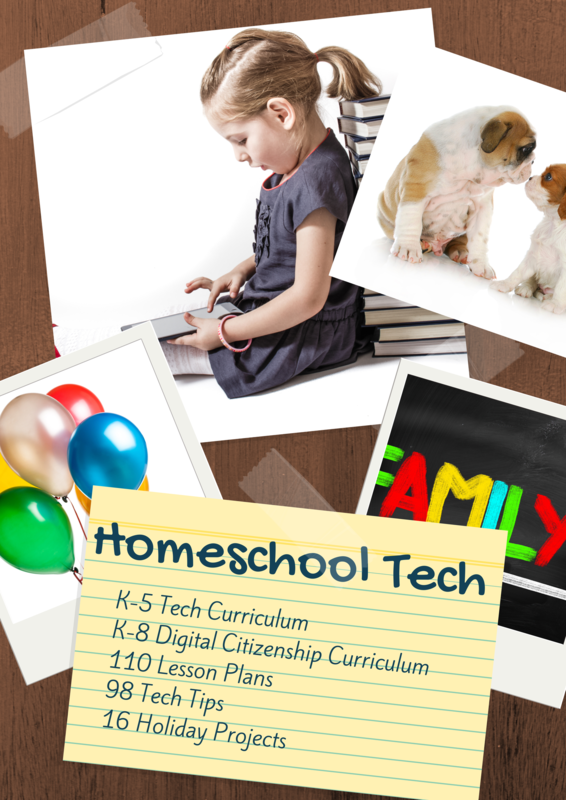 these are the sites that have kids excited about learning--excited about technology. So what are we doing? We're cutting off the most effective avenue for keeping students interested in school because we're afraid of them. Does that sound right to you? I'd chat a little longer, but my computer is telling me there's no printer installed. I know there is, so I'm going to reintroduce computer and printer. See you tomorrow! Here's my class wiki, lots of formatting thanks to this website. Lenva (the author) tells you how to password protect it, add columns, change the name, embed a webpage and more. Q: When I insert my picture, the background isn't transparent, so it covers everything behind it. I want it see-through. How do I do that? BTW, I'm using Publisher. A: There are two ways, one simpler than the other. 07/23/10 - God is Back: How the Global Revival of Faith is Changing the World. what has been true all along: the vast majority of people outside the West, and many people in the West, are religious. When I give my students five or ten minutes to select any website from our internet start page links, Hangman is the most popular. Kids play it with a neighbor or by themselves. Get rid of it. It's huge and designed to allow you to place multiple shapes that are moved and resized as one. When you get yours set up, on the To Do list, put what the child should do to start each computer time. This gives them a sense of independence, adultness, as they get started while you’re wrapping something else up. Schools throw technology at their problems in hopes software, hardware, internet websites, will fix their shrinking test scores. Be Different. The average home schooled 8th grade student performs four grade levels above the national average. Push the Flying Windows key (it’s between Ctrl and Alt). Don't always feel you must reinvent the wheel. You're not capitulating if you take the road more traveled. Zoopz: Easy to understand, to maneuver. Bright colors that attract youngers and almost no ads. Hold down the Ctrl and + to zoom in. Hold down Ctrl and – to zoom out. You want a program that teaches a bit about mouse functions, tools and toolbars, maybe even some text? You're looking for KidPix. Who cares what your processing speed is if your hard drive is to die for? When you have a website you want to send to people, copy it, paste it into the email/doc. Be sure to add a space or enter afterwards. I get students to the website and leave the rest to their curiosity and the explorative side of human nature. From first grade on, they figure out what to do. Don't be afraid to say, My RAM is full! That's what computers do. It not only grabs a picture, but a video of what you’re doing, allows you to add highlighting, arrows, text, and more.